Why was President Obama initially unwilling to call it an act of terror? 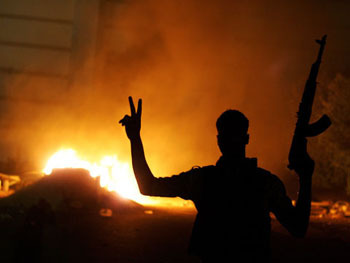 A day after the attacks, the CIA station chief in Libya reported to Washington that there were eyewitness reports that the attack was carried out by militants. Why didn’t Obama administration officials say so? Okay, but that McClatchy report quoted above also says that a few days after the attacks administration officials started putting more emphasis on the “Innocence of Muslims” video. Why? It had nothing to do with the Benghazi attacks. So the video might have played a role. But why did UN ambassador Susan Rice put the video front and center in her Sunday morning appearances a week after the attacks? Still, why even mention the video? By that point, wasn’t it clear that the real cause of the attacks lay elsewhere? Fine. But why did Rice suggest that the attacks came after a “spontaneous” protest at the Benghazi consulate? There was no protest. But why did anyone think there was anything “spontaneous” about this in the first place? In fact, the assault on the consulate was preplanned by “Al Qaeda elements,” as Libyan President Mohammed Magarief said, wasn’t it? Still, the Obama administration was negligent in refusing a stream of requests from American diplomats in Libya to provide more security, wasn’t it? Bottom line: There were conflicting reports on the ground, and that was reflected in conflicting and sometimes confused reports from the White House. I don’t think anyone would pretend that the Obama’s administration’s response to Benghazi was anywhere near ideal. Nevertheless, the fact is that their statements were usually properly cautious; the YouTube video really did play a role; the attack was opportunistic, not preplanned; and it doesn’t appear to have had any serious connection with Al Qaeda. It’s true that it took about 10 days for all this to really shake out, but let’s be honest: 10 days isn’t all that long to figure out what really happened during a violent and chaotic attack halfway around the world. I get that it’s a nice opportunity for Republicans to score some political points in the runup to an election, but really, there’s not much there there.